^ a b c d e f g h Malenka RC, Nestler EJ, Hyman SE (2009). Sydor A, Brown RY (eds.). Molecular Neuropharmacology: A Foundation for Clinical Neuroscience (2nd ed.). New York: McGraw-Hill Medical. pp. 147–48, 366–67, 375–76. ISBN 978-0-07-148127-4. ^ a b c d e f Seeman P (2009). 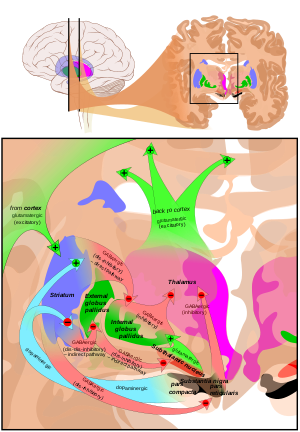 "Chapter 1: Historical overview: Introduction to the dopamine receptors". In Neve K (ed.). 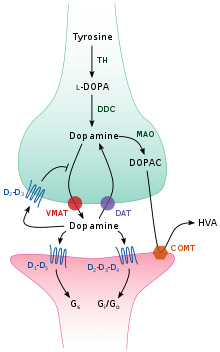 The Dopamine Receptors. Springer. pp. 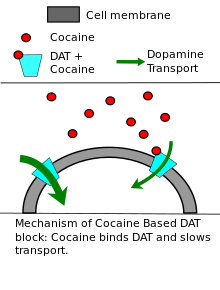 1–22. ISBN 978-1-60327-333-6. ^ a b c d e f g h i j Musacchio JM (2013). "Chapter 1: Enzymes involved in the biosynthesis and degradation of catecholamines". In Iverson L (ed.). Biochemistry of Biogenic Amines. Springer. pp. 1–35. ISBN 978-1-4684-3171-1. ^ a b c d Romanelli RJ, Williams JT, Neve KA (2009). "Chapter 6: Dopamine receptor signalling: intracellular pathways to behavior". In Neve KA (ed.). 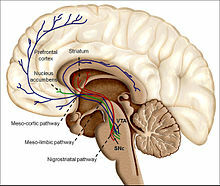 The Dopamine Receptors. Springer. pp. 137–74. ISBN 978-1-60327-333-6. ^ a b c d Malenka RC, Nestler EJ, Hyman SE (2009). "Chapter 6: Widely Projecting Systems: Monoamines, Acetylcholine, and Orexin". In Sydor A, Brown RY (eds.). Molecular Neuropharmacology: A Foundation for Clinical Neuroscience (2nd ed.). New York: McGraw-Hill Medical. pp. 147–48, 154–57. ISBN 978-0-07-148127-4. ^ Standaert DG, Walsh RR (2011). 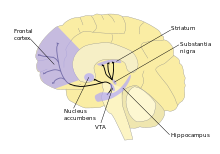 "Pharmacology of dopaminergic neurotransmission". In Tashjian AH, Armstrong EJ, Golan DE (eds.). Principles of Pharmacology: The Pathophysiologic Basis of Drug Therapy. Lippincott Williams & Wilkins. pp. 186–206. ISBN 978-1-4511-1805-6. ^ Dickson DV (2007). "Neuropathology of movement disorders". In Tolosa E, Jankovic JJ (eds.). Parkinson's disease and movement disorders. Hagerstown, MD: Lippincott Williams & Wilkins. pp. 271–83. ISBN 978-0-7817-7881-7. ^ a b Malenka RC, Nestler EJ, Hyman SE (2009). "Chapters 10 and 13". In Sydor A, Brown RY (eds.). Molecular Neuropharmacology: A Foundation for Clinical Neuroscience (2nd ed.). New York: McGraw-Hill Medical. pp. 266, 318–23. ISBN 978-0-07-148127-4. ^ Roshchina VV (2010). "Evolutionary considerations of neurotransmitters in microbial, plant, and animal cells". In Lyte M, Primrose PE (eds.). Microbial Endocrinology. New York: Springer. pp. 17–52. ISBN 978-1-4419-5576-0.